Paddenberg, R., Mermer, P., Goldenberg, A., Kummer, W. Videomorphometric Analysis of Hypoxic Pulmonary Vasoconstriction of Intra-pulmonary Arteries Using Murine Precision Cut Lung Slices. J. Vis. Exp. (83), e50970, doi:10.3791/50970 (2014). Acute alveolar hypoxia causes pulmonary vasoconstriction (HPV) - also known as von Euler-Liljestrand mechanism - which serves to match lung perfusion to ventilation. Up to now, the underlying mechanisms are not fully understood. The major vascular segment contributing to HPV is the intra-acinar artery. This vessel section is responsible for the blood supply of an individual acinus, which is defined as the portion of lung distal to a terminal bronchiole. Intra-acinar arteries are mostly located in that part of the lung that cannot be selectively reached by a number of commonly used techniques such as measurement of the pulmonary artery pressure in isolated perfused lungs or force recordings from dissected proximal pulmonary artery segments1,2. The analysis of subpleural vessels by real-time confocal laser scanning luminescence microscopy is limited to vessels with up to 50 µm in diameter3. We provide a technique to study HPV of murine intra-pulmonary arteries in the range of 20-100 µm inner diameters. It is based on the videomorphometric analysis of cross-sectioned arteries in precision cut lung slices (PCLS). This method allows the quantitative measurement of vasoreactivity of small intra-acinar arteries with inner diameter between 20-40 µm which are located at gussets of alveolar septa next to alveolar ducts and of larger pre-acinar arteries with inner diameters between 40-100 µm which run adjacent to bronchi and bronchioles. In contrast to real-time imaging of subpleural vessels in anesthetized and ventilated mice, videomorphometric analysis of PCLS occurs under conditions free of shear stress. In our experimental model both arterial segments exhibit a monophasic HPV when exposed to medium gassed with 1% O2 and the response fades after 30-40 min at hypoxia. In most systemic vascular beds hypoxia induces vasodilatation, in comparison to the vasoconstriction caused by hypoxia in the pulmonary vasculature. This lung-specific response to lowered oxygen tension is called hypoxic pulmonary vasoconstriction (HPV), onsets within seconds and reverses quickly after switchback to normoxic ventilation. Although HPV is known for more than 60 years, the cellular oxygen sensor(s) and the signaling cascade(s) resulting in vasoconstriction are still under debate. There is a relative broad consensus that hypoxia-evoked redox and ROS changes are essential for HPV and the development of pulmonary hypertension (reviewed in Sylvester et al.4 and Schumacker et al.5). Our own data support a central role of complex II of the mitochondrial respiratory chain in HPV6,7. Recently, Wang et al. presented a completely new concept for oxygen sensing and HPV: Based on their data they propose that alveolar hypoxia is sensed by the adjacent capillaries causing membrane depolarization of the endothelial cells. The response is propagated via connexion 40 gap junctions of the endothelial cells leading to constriction of smooth muscle cells of upstream arterioles8. The arteries of the lung run alongside the airways, branch with them, continuously decrease in diameter, and finally supply blood to the capillary system located in the alveolar walls. This arterial circulation is composed of anatomically and functionally distinct segments. The proximal conduit arteries, characterized by an abundance of elastic fibers in the walls, are followed by fully muscularized intra-pulmonary arteries which largely control the pulmonary vascular resistance. Step-by-step, these arteries transit into segments where the muscle layer becomes incomplete, and finally the vessels are free of smooth muscle actin-immunoreactive cells. The intra-acinar artery feeding an individual pulmonary acinus with blood represents a partially muscular segment6. Likewise, the pulmonary arterial system does not represent a uniform structure regarding the hypoxic response but exhibits marked regional diversity9,10. For instance, in proximal pulmonary arteries isolated from rat lungs hypoxia induces a biphasic response, displaying an initial rapid contraction of short duration which - after incomplete relaxation - is followed by a second slow but sustained contraction11. In resistance arteries isolated from rat lung parenchyma as fourth- and fifth-division of pulmonary arteries (external diameter <300 μm), hypoxia causes monophasic constriction9. Already in 1971 Glazier and Murray concluded from measurements of changes in the capillary red blood cell concentration in lungs of dogs ventilated with hypoxic gas mixtures that the hypoxia-induced increase in vascular resistance mainly occurred upstream of the capillaries12. Nowadays, intravital microscopy of intact lungs of anesthetized and mechanically ventilated mice represents a powerful tool for the analysis of the pulmonary microvasculature13,14. Excision of a circular window in the thoracic wall gives microscopic access to the surface of the lung and allows the analysis of subpleural pulmonary vessels with up to 50 µm in diameter. By combining this technique with the infusion of FITC-dextran, Tabuchi et al. demonstrated that only medium sized arterioles with diameters of 30-50 µm exhibit a marked response to hypoxia which sustained over a period of 60 min with a minor attenuation after 30 min. In contrast, small arterioles with diameters of 20-30 µm showed only a minor response to hypoxia3. However, this technique does not allow the analysis of arteries with diameter larger that 50 µm since these vessels are located too deep in the lung tissue. In order to bridge the gap in the analysis of large and very small pulmonary arteries (such as the subpleural vessels) of murine lungs, we adopted a method that was described by Martin et al. for analysis of the reactivity of airways15. Based on an agarose gel instilling technique, it facilitates the preparation of precision cut lung slices (PCLS) from this relatively soft and elastic organ. Within the PCLS vasoreactivity of cross-sectioned arteries with inner diameter between 20-100 µm can be directly observed by videomicroscopy. Application of drugs during the hypoxic incubation of the PCLS allows the analysis of their effects on HPV. It is of particular importance that this technique can also be applied to genetically engineered mouse. Based on their location within the lung, we classify the arteries as pre- and intra-acinar vessels, with inner diameters of 20-40 µm and 40-100 µm, respectively. Under a functional view the intra-acinar artery supplies an individual pulmonary acinus with blood and the pre-acinar artery is the preceding vessel sections. Recording of pictures on a digital camera allows the subsequent quantification of the vasoreaction. An obvious attribute of this PCLS model is the lack of shear-stress acting upon the endothelium. In contrast, in perfused vessels acute HPV leads to a rise in shear-stress thereby inducing secondary mechanisms such as NO release16. Additionally, the use of PCLS allows measurements of HPV without extrapulmonary neural or hormonal influences. In contrast to cell culture systems, for instance prepared from canine pulmonary arterial smooth muscle cells17, the histological architecture of the vessel wall is almost completely preserved. In summary, this protocol provides a helpful method for analysis of potential molecular oxygen sensors and/or cellular pathways responsible for HPV of intra-pulmonary arteries with inner diameters between 20-100 µm under conditions free of shear stress. This section describes the necessary equipment and set-up for the protocol. Additional details and manufacturer information can be found in the accompanying table. Two bottles with normoxic gas mixture composed of 21% O2, 5.3% CO2, 73.7% N2. One bottle with hypoxic gas mixture composed of 1% O2, 5.3% CO2, 93.7% N2. A microwave oven, for melting the agarose. A heating cabinet, for washing out the agarose from the lung sections (see below). Insert a tube connected to a bottle with normoxic gas mixture into the cabinet. A vibratome with appropriate razor blades, for cutting the lungs into 200 μm thick slices. It is advantageous if the vibratome is furnished with a refrigerating set to cool down the buffer in the vibratome basin. A flow-through superfusion chamber mounted on an inverted microscope, for analysis of HPV of intrapulmonary arteries. To facilitate fixation of the lung sections to the bottom of the chamber, connect nylon strings to a platinum ring (self-constructed). Join the perfusion chamber to a peristaltic pump with flow rates adjusted to 0.7 ml/min and 6 ml/min, respectively. Assemble the equipment so that during the experiments the media are stored in a 37 °C water bath and bubbled with normoxic or hypoxic gas using 21 G x 4 ¾ cannulas. Additionally use a second connection from the gas bottle to allow the normoxic/hypoxic gas mixtures to be fed into the air space of the perfusion chamber. Ensure that all tubes of this system are gas tight. A CCD-camera mounted on an upright inverted microscope to record images of the artery analyzed. For preparation of the lungs: a sterile dissecting set including a rough scissor and two pairs of forceps, a fine scissor for opening of the chest, a microscissor to cut a hole into the trachea for filling in the agarose, and sewing cotton (about 20 cm) for ligation of the trachea to prevent outflow of the agarose. For filling of the airways with agarose: connect a 2 ml syringe to the flexible plastic pipe of an IV indwelling cannula (20 G x 1 ¼). For perfusion of the lungs with buffer: fix a 50 ml syringe as a buffer reservoir about 40 cm above the working place for the mouse preparation. For outflow of the buffer: connect the syringe to a tube to which a 25 G x 1 cannula is attached. Use a clamp at the tube to adjust the outflow to about 1 drop/sec (about 0.3-0.4 ml/min). Make 1,000 ml HEPES-Ringer buffer (10 mM HEPES, 136.4 mM NaCl, 5.6 mM KCl, 1 mM MgCl2•6H2O, 2.2 mM CaCl2•2H2O, 11 mM glucose, pH 7.4). Store the sterile filtrated buffer (pore size of filter: 0.2 µm) at 4 °C. Dissolve 1.5% w/v low melting point agarose in HEPES-Ringer buffer (total volume 10 ml) and melt it by cooking in a microwave oven. Subsequently, cool it down to 37 °C by storage in a heating cabinet. Prewarm the 2 ml syringe for filling the agarose into the pulmonary airways. Take 20 ml of the HEPES-Ringer buffer, add heparin to a final concentration of 250 I.U./ml, and heat the buffer to 37 °C. Immediately before use add sodium nitroprusside to a final concentration of 75 µM. This is the perfusion buffer for running off the blood from the pulmonary vasculature. Put 200 ml HEPES-Ringer buffer in a glass beaker and store it on ice. This buffer will be needed for cooling down the agarose-filled isolated lungs. Fill about 200 ml MEM supplemented with 1% penicillin/streptomycin in a glass beaker and store it at 37 °C in the heating cabinet. Bubble the medium with normoxic gas mixture. This will be used for removal of the agarose from the lung sections. Prewarm 2 bottles of MEM supplemented with 1% penicillin/streptomycin in a water bath to 37 °C and bubble them with normoxic and hypoxic gas mixture, respectively, for at least 2 hr before starting the videomorphometric measurements. Approximately 250 ml MEM will be required per measurement. Stock solution of heparin (25.000 I.U./5 ml), stored at 4 °C (see above). Stock solution of the NO donor sodium nitroprusside (Nipruss): 10 mM in H2O, stored on ice (see above). Stock solution of thromboxane analog U46619: 10 µM in ethanol, stored on ice. Sewing cotton for ligation of the trachea after filling with agarose. Use mice (for instance of the strain C57Bl6) of both genders at an age of 10-25 weeks. HPV can also be analyzed in knockout strains and the corresponding wild type strains. All experiments were performed according to the NIH guidelines for the care and use of experimental animals, and were approved by the local institutional boards. Kill the mouse by cervical dislocation. Immediately after killing, sterilize the ventral body surface with 70% EtOH and use the rough scissor to cut the skin along the ventral midline from the chin to the pelvis. Note: Since it is known that inhalative anesthetics such as isoflurane have an impact on the vascular tone18,19, do not use volatile anesthetics. After opening of the abdominal cavity, put the intestinal loops aside and sever the large abdominal vessels for bleeding. After penetrating the diaphragm with the fine scissor, the lungs will collapse as a result of air entry into the pleural cavity. Use the scissor to detach the diaphragm from the inferior thoracic aperture. Cut the ribs and the clavicle laterally to remove the ventral part of the rip cage. Note: It is important that the lungs are not damaged in this step since otherwise bloating of the lungs with agarose will be impossible! Use only sterile instruments and laboratory glassware. Before starting the perfusion of the pulmonary vasculature, cut a small hole into the left ventricle of the heart for discharge of the buffer. Fill the syringe reservoir with warm (37 °C) HEPES-Ringer buffer containing heparin and sodium nitroprusside (perfusion buffer) and perfuse the pulmonary vasculature slowly via the right ventricle. Note: Perfusion is efficient when the lungs change their color and get a white appearance. In this step it is important to add sodium nitroprusside into the perfusion buffer; this prevents the pre-acinar arteries from ripping off from the surrounding tissue. Remove the salivary glands, small muscles and connective tissue from the trachea. Disconnect the trachea from the surrounding connective tissue and thread sewing cotton between esophagus and trachea for later ligation. Use the microscissor to cut a small hole into the upper part of the trachea between two neighboring tracheal cartilages. Now insert the flexible plastic pipe of an IV indwelling cannula via the small hole into the trachea and carefully fix it with the sewing cotton. Slowly fill the airways with the warm (37 °C) low melting point agarose. Observe the lungs: At first the right lung starts to expand followed by the left lung. Filling is completed when both lungs are inflated to a volume comparable to the in vivo situation (about 1.2-2.0 ml depending on gender, age, and weight). Note: If only one lung expands, the plastic pipe may have been inserted too deep so that it has reached the bronchus. In this case, it has to be pulled out a little bit. Keep in mind that the agarose will solidify when it gradually cools down. When the lungs are full, simultaneously pull out the plastic pipe and ligate the trachea with the sewing cotton to prevent outflow of the agarose. Subsequently, cut the trachea above the ligature and detach lungs and heart on bloc from the chest. Note: For beginners, it may be helpful to ask a colleague for support in the ligation step. Transfer the organ packet into ice-cold HEPES-Ringer buffer to solidify the agarose. This happens within a few minutes. Separate the individual lung lobes and fix one lobe with superglue on the specimen holder of the vibratome. Note: It is helpful to stick a piece of a champagne cork on the holder which serves as skewback during cutting of the elastic lung tissue. Depending on the lung lobe used and on its orientation on the specimen holder, the PCLS obtained may be more suited for analysis of small or large vessels. Mostly we use the left lobe and the right cranial lobe for the preparation of the PCLS. To get cross-sectioned small intra-acinar arteries, glue the cranial right lobe with the hilum to the holder and slice from the periphery. To get cross-sectioned pre-acinar arteries, align the hilum of the right lobe with the champagne cork. Use a vibratome equipped with a fresh razor blade to cut the lung lobe into 200 μm thick slices (speed: 12 = 1.2 mm/sec; frequency: 100; amplitude: 1.0). Collect the PCLS in the vibratome basin filled with 4 °C cold HEPES-Ringer buffer. Note: Cooling of the HEPES-Ringer is recommended but nonessential. For removal of the agarose, transfer the organ sections into a glass beaker filled with about 200 ml 37 °C warm MEM. Put the beaker into the heating cabinet into which a tube joined to a bottle with normoxic gas mixture is inserted. Bubble the MEM with the normoxic gas so that the lung sections are slowly moving in the medium. After about 2 hr, the "agarose plaques" filling the airspaces will be removed from the lung tissue. This can be recognized by the fact that the sections are no longer swimming on the top of the medium but settle on the bottom of the beaker. For videomorphometric analysis of intra-pulmonary arteries, transfer one PCLS into the flow-through superfusion chamber filled with 1.2 ml normoxic gassed MEM. Fix the PCLS at the bottom of the chamber with nylon strings connected to a platinum ring (outer/inner diameter: 14/10 mm). Scan the PCLS microscopically for cross-sectioned arteries with inner diameters between 20-100 µm. Note: The lumen of the arteries is lined by flat endothelial cells. The surrounding smooth muscles cells can be identified in the phase contrast image as a "dark ring" surrounding the lumen (see phase contrast images in Figure 2). In contrast, airways can be identified by the initially pseudostratified columnar epithelium which transits on the way to the pleural surface into a simple columnar epithelium followed by a simple cuboidal epithelium. Measure the inner diameter at the beginning of each experiment. Note: In slightly obliquely cut vessels, the true inner diameter of the tubular structure can be determined in a 90° angle to the longest axis of the lumen. Large pre-acinar arteries with inner diameters >40 µm run adjacent to bronchi and bronchioles. Small intra-acinar arteries with inner diameter <40 µm are located at gussets of alveolar septa next to alveolae and alveolar ducts6. Begin each experiment with an "adaptation phase" in which the chamber is perfused with normoxic gassed medium (flow rate: 0.7 ml/min; 10 min). Next, test the viability of the vessel: Analyze contractility of the artery by the addition of 12 µl of 10 µM U46619 (final concentration 0.1 µM; 10 min; no flow). Note: For this work, a vessel is defined as viable when the luminal area is reduced by at least 30% (for method of measurement see below). After washing out the drug with normoxic gassed medium (flow rate: 6 ml/min; 10 min) dilate the artery by application of 3 µl of 10 mM Nipruss (final concentration 25 µM; 10 min; no flow). Again, remove the drug by a 10 min wash with normoxic gassed medium (flow rate: 6 ml/min) followed by 10 min at a flow of 0.7 ml/min. Induce hypoxic pulmonary vasoconstriction by incubation of the PCLS with hypoxic gassed medium (flow rate: 0.7 ml/min; 40 min). By an additional tube system, feed the hypoxic gas mixture into the air space of the perfusion chamber. Remove the hypoxic medium by a 20 min wash with normoxic gassed medium (flow rate: 6 ml/min). At the end of each experiment, add 1.2 µl of 10 µM U46619 (final concentration 0.01 µM; 20 min; no flow) to the perfusion chamber to induce vasoconstriction. Note: This final step allows determination of whether a change in the hypoxic response (for instance induced by simultaneous application of a drug in the hypoxic phase or observed in a PCLS prepared from a knockout mouse strain) is specific for the hypoxia-induced constriction or whether it reflects a general impact on contractility. The concentration of 0.01 µM corresponds to the EC50 value of U46619 which was estimated in previous concentration-contraction measurements (not published). Use another PCLS to perform control experiments with normoxic instead of hypoxic gassed MEM and normoxic gas mixture in the air space of the perfusion chamber. Using suitable software take pictures from the cross sectioned artery every minute during the entire experiment. Using suitable software evaluate changes of the luminal area of the vessels by lining the inner boundaries by hand using full-screen pictures. Note: It is sufficient to analyze every second picture to get clear graphs. However, when one condition in the flow-through superfusion chamber is changed to another, analyze every picture. The remaining pictures serve as back-up in case one photograph can not be analyzed. Unfortunately, this time consuming step has to be done by hand and not by appropriate programs since sometimes blood cells are attached to the vascular wall which are moving during the measurement or it is not a perfect cross section of the vessel but a tangential section in which a reliable localization of the inner boundaries can only be done under visual control. Define the value obtained for the area of the vessel lumen at the beginning of the experiment as 100% and express vasoconstriction or dilatation as relative decrease or increase of this value. For each experiment plot the relative luminal area against time using suitable software. To summarize several experiments, plot the means of the relative luminal areas +/- standard error of the mean (SEM) against time. Note: For a clear presentation of the effects of various substances on hypoxia- or U46619-induced pulmonary vasoconstriction or of the hypoxic response of knockout mouse strains, the initial phase of the experiments, in which the viability of the vessel is tested, can be omitted from the graph. In this case, the values obtained at the beginning of the exposure to reduced oxygen are defined as 100%. Analyze differences among experimental groups with the Kruskal-Wallis- and the Mann-Whitney-test, with p≤0.05 being considered significant, and p≤0.01 highly significant. Note: For additional information on the preparation and operational use of PCLS see also20,21. In Figure 1 the results of the measurement of HPV of a large pre-acinar artery and in Figure 2 of small intra-acinar arteries are given. In the phase contrast images (Figures 1A and 2A) it becomes clear that it is possible to discriminate these 2 classes of arteries based on their location within the lung tissue: Pre-acinar arteries run in close neighborhood to bronchi and bronchioli (Figure 1A), whereas the intra-acinar arteries are located at gussets of alveolar septa and surrounded by alveolae (Figure 2A). With a little practice it is possible to see the changes in the luminal area in response to U46619 on the phase contrast pictures (Figures 1A and 2A). However, hypoxic pulmonary vasoconstriction is often not so pronounced and becomes clear only after complete evaluation of the changes of the luminal areas (Figures 1B, 1C, 2B, and, 2C). For didactic reason we have given an example of a pre-acinar artery which shows an unusually pronounced vasoconstriction. On average, HPV results in a 20-30% reduction of the luminal area. In Figure 2 the recordings of small intra-acinar arteries incubated with hypoxic-gassed medium with or without 50 µM pinacidil (a nonselective opener of mitochondrial ATP-sensitive potassium channels) are shown and the inhibitory effect of the drug becomes clearly visible. The final part of the experiment demonstrates the selectivity of the action of the drug on HPV: Vasoconstriction induced by the thromboxane analog U46619 is not changed by the addition of pinacidil. Indeed, the curve for the artery exposed the pinacidil runs distinctly lower than the other two, but the extent of reduction of the luminal area by U46619 alone is comparable. In this case it was the incomplete reversion of HPV which causes the difference between the curves. In this graph also an artery exposed to normoxic gassed medium is included as additional control. Under this condition, no changes of the luminal area are detectable. In Figure 3 the data of the complete series of measurements on the influence of pinacidil on HPV are shown. For comparison of the two groups for statistical differences, the data sets of the time points indicated were analyzed with the Kruskal-Wallis- and the Mann-Whitney-test. HPV was clearly abolished in presence of pinacidil whereas U46619-induced contraction was unchanged. Figure 1. Measurement of HPV of a large pre-acinar artery. (A) Phase contrast images of a cross-sectioned pre-acinar artery (a) which runs in close neighborhood to a cross-sectioned bronchus (B). The pictures are taken at the time points indicated in (B) by circles: at the beginning of the measurement (a), at the end of the treatment with U46619 (b), at the end of exposure to Nipruss (c), after 30 or 40 min in hypoxic gassed medium (d, e), after washing with normoxic gassed medium (f), and after the final application of U46619 (g). In the graph (B) changes of the luminal area are plotted against time whereas the luminal area at the beginning of the experiment is defined as 100% and vasoconstriction/-dilatation are given as relative values. In this case hypoxia induces a 60% reduction of the luminal area. (C) For a clearer presentation of the hypoxic response, the initial phase of the experiment in which the vasoreactivity was tested is not included, but the value obtained immediately before exposure to reduced oxygen is set as 100% (see also Figure 2). Click here to view larger image. Figure 2. Impact of pinacidil (a nonselective opener of mitochondrial ATP-sensitive potassium channels; mitoKATP) on HPV of small intra-acinar arteries. (A) Intra-acinar arteries (a) are located at gussets of alveolar septa. Alv = alveolus. The sequence of the individual conditions applied in these experiments is given in the headline of the graph (B). Hypoxic exposure is performed in presence or absence of 50 µM pinacidil. Control incubations are done with normoxic gassed medium. Pictures shown in (A) are taken at the beginning of the measurement (a, a', a"), at the end of the treatment with U46619 (b, b', b"), at the end of exposure to Nipruss (c, c', c"), after 30 or 40 min in hypoxic or normoxic gassed medium (d, d', d"; e, e', e"), after washing with normoxic gassed medium (f, f', f"), and after the final application of U46619 (g, g', g"). For a clearer presentation of the response to normoxia/hypoxia/hypoxia+pinacidil, the values obtained immediately before exposure to normoxic-/hypoxic-gassed medium are set as 100% (C). Click here to view larger image. Figure 3. Inhibition of HPV by pinacidil. The recordings of small intra-acinar arteries exposed to hypoxic gassed medium with or without 50 µM pinacidil are summarized and presented as means ± SEM. In (A) the complete recordings are given, in (B) the relative data in relation to the value at the beginning of the hypoxic incubation are shown. No vasoreactivity is detectable in PCLS which are exposed to hypoxic-gassed medium containing pinacidil. Vasoconstriction induced by U46619 is not affected by the drug. "n" in brackets refers to the number of arteries/number of animals from which PCLS were made. In other words the first number describes the count of lung sections analyzed and the second number gives the count of mice from which these sections were prepared. At the given time points the differences between both groups are tested for significance. n.s. : not significant, *: p≤0.05, **: p≤0.01, ***: p≤0.001. Click here to view larger image. Figure 4. Schematic overview of the method. Briefly, mice are killed by cervical dislocation. After opening of the chest, the lungs are filled with low melting point agarose and after cooling down cut into 200 µm thick precision cut lung slices (PCLS). After removing the agarose at 37 °C one PCLS is transferred into the flow-through superfusion chamber in which it is exposed to normoxic medium or to medium gassed with 1% O2. Vasoreactivity is recorded as changes in the luminal area. Click here to view larger image. The isolated ventilated and perfused mouse lung is an excellent model for the analysis of the physiological response of the pulmonary vascular system on changes in oxygen supply and among others permits the continuous measurement of the pulmonary arterial pressure1. However, this model does not allow the identification and analysis of those vascular segment(s) showing the strongest response to hypoxia. This is the advantage of our videomorphometric analysis of PCLS which facilitates the measurement of HPV of individual arteries with inner diameters of 20-100 µm. PCLS represent an attractive in vitro model since they closely resemble the organ from which they are prepared. In contrast to cell culture systems, all cell types are present in their original tissue-matrix configuration. Furthermore, one lung is sufficient for the preparation of many PCLS, so that at least partially experiments can be standardized by the use of sections from the same mouse. According to the 3R concept (reduction, refinement and replacement of laboratory animals in the life sciences) of Russell and Burch23 this fact also argues for the use of PCLS. However, one has to keep in mind, that the tissue is damaged by cutting with a vibratome and longitudinal signaling for instance via the endothelial cells as postulated by Kübler et al.14 is no longer possible. Initially, PCLS were mainly applied for biochemical, pharmacological and toxicological studies, but in the meantime they are also used for measurement of bronchial contractility, mucociliary function and vascular responses (for reviews see Sanderson20 and Davies21). Held et al. have performed a study in which they compared the models of isolated perfused and ventilated mouse lung and of PCLS24. They found by analysis of the responses of airways and pulmonary vessels to a variety of endogenous mediators that important characteristics of the whole lung were maintained in PCLS. In PCLS, hypoxic conditions are not established via the airways as in the intact lung but by incubation of the lung section in hypoxic-gassed medium. We have analyzed the oxygen partial pressure (pO2) of medium pregassed with 1% O2, 5.3% CO2, 93.7% N2 and with 21% O2, 5.3% CO2, 73.7% N2, respectively, using a blood gas analyzer. Immediately before feeding it into the perfusion chamber, the pO2 of the hypoxic gassed MEM was 40 mmHg and that of the normoxic gassed medium 160 mmHg6. In the intact lung HPV is induced when alveolar pO2 drops below 50 mmHg25, a situation which can be obviously mimicked by application of hypoxic-gassed medium. Our data on the extent of HPV matches well to results obtained with a different experimental approach. Yamaguchi et al. have applied isolated rat lungs to examine microvessels with diameter of 20-30 µm by real-time confocal laser scanning luminescence microscopy coupled to a high-sensitivity camera with an image intensifier10. They observed a mean reduction in diameter of 2.7 µm after exposure of the lungs to hypoxia. One can calculate that a 20% reduction of the luminal area as we measure it in our system corresponds to about 15% decrease in diameter. In our experiments we have classified the arteries as pre- and intra-acinar vessels, respectively, with inner diameters of 40-100 µm and 20-40 µm. In humans the transition from muscular to nonmuscular arteries occurs in the diameter range of 70-100 µm. In mice, smooth muscle cells are present down to an external diameter of 20 µm26. For this reason it is not possible to analyze arteries with diameters below 20 µm since they can not reliable be identified based on the phase contrast image. At the other end of the scale, vessels with diameters above 100 µm are hardly to find in PCLS and commonly stripped from the surrounding tissue. Actually, a number of molecular candidates are discussed as molecular oxygen sensor(s) or as component of the signaling cascade resulting in HPV (for a review see Sylvester et al.4). Once appropriate knockout mice are available videomorphometry can be used for analysis of vasoreactivity of pre- and intra-acinar arteries as compared to wild type animals. However, PCLS have also been used for other issues: Faro et al. employed them to characterize the development of the endothelium dependent dilation in lung after birth29 and PCLS prepared from guinea pigs exposed to smoke or air daily for 2 weeks were used to demonstrate the impact of cigarette smoke on vasoreactivity via induction of endothelial dysfunction30. In our experiments we classified the arteries as pre-acinar (inner diameters of 40-100 µm) and intra-acinar (inner diameters of 20-40 µm). Especially for the preparation of lung sections which should be used for the analysis of larger vessels it is important to add sodium nitroprusside to the perfusion buffer. This drug prevents the contraction of the vessels during the sample preparation and thereby their rip off from the surrounding tissue leading to incomplete vasodilation. Sodium nitroprusside in the perfusion buffer is not so important for the preparation of lung section which should be used for analysis of small arteries because they are strongly anchored to the alveolar septa. All experiments should be started with incubations in which the reactivity of the arteries is tested. Rarely, we obtained lung preparations in which no response of vessels to contractors or dilators was detectable. We do not know the reason for this: May be that the volume of the agarose filled into the lungs was too great or too low so that cutting of the organ into PCLS was not optimal. Alternatively, it is imaginable that the agarose was cooling down too fast during the instillation procedure resulting in damaging shear stress. In case that in an individual PCLS no viable artery is detectable, the section has to be discarded and replaced by another one. The decision on the viability of an artery was made based on the response to U46619. Application of U46619 at a concentration of 0.1 µM induces a vasoconstriction which - after some exercise - is visible directly in the image sequence at the screen. Since there are some variances in the vasoreactivity we investigate the impact of a drug on HPV by measuring the vasoresponse in lung sections exposed to the drug or to the medium alone in turn. HPV of an individual artery is often hardly detectable in the microscope, and in average it results in a reduction of the luminal area of about 20-30%. However, small changes in the diameter of an artery have a distinct input on flow resistance. According to the equation "R = 1/r4" with R=resistance and r=radius, the flow resistance is inversely proportional to the fourth power of the radius. Let me give an example: An "ideal artery" exhibiting a circular cross-section with a diameter of 40 µm (r=20 µm) has a luminal area of about 1,260 µm2. When the luminal area is reduced by 20%, we can calculate that the diameter of the vessel is reduced by 10.5% to 35.8 µm (r=17.9 µm). According to the equation given above, the flow resistance of this vessel would increase from 6.25 x 10-6 to 9.71 x 10-6 that is by about 55%. In case of a reduction of the luminal area by 30% the radius would decrease by about 16%, but the flow resistance would increase by about 100%. Although these calculations are an oversimplification in which a laminar blood flow and a vessel form of a rigid pipe are assumed it is suggestive of the impact of already minor changes of the diameter on flow resistance. This research is sponsored by the Excellence Cluster Cardio-Pulmonary System. Weissmann, N., Akkayagil, E., et al. Basic features of hypoxic pulmonary vasoconstriction in mice. Respir. Physiol. Neurobiol. 139, 191-202 (2004). 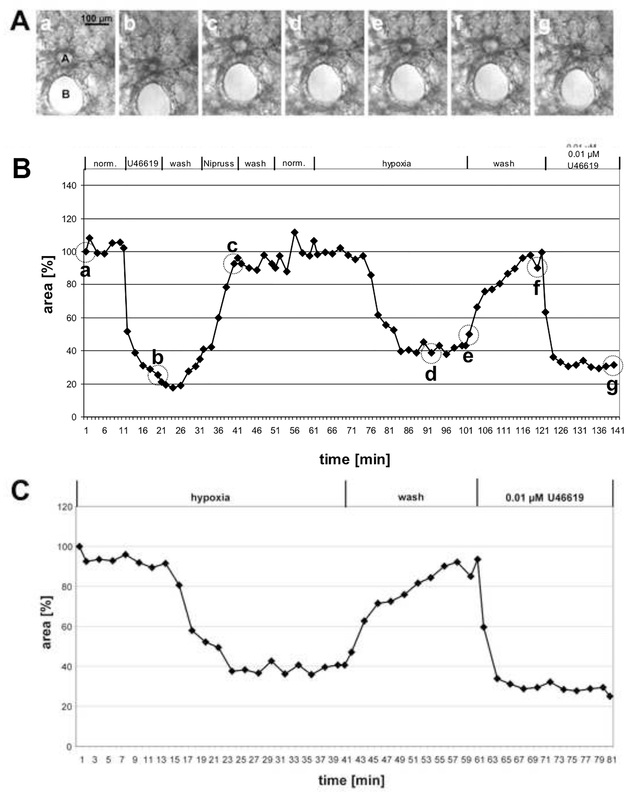 Leach, R. M., Hill, H. M., Snetkov, V. A., Robertson, T. P., Ward, J. P. T. Divergent roles of glycolysis and the mitochondrial electron transport chain in hypoxic pulmonary vasoconstriction of the rat: identity of the hypoxic sensor. J. Physiol. 536, 211-224 (2001). Tabuchi, A., Mertens, M., Kuppe, H., Pries, A. R., Kuebler, W. M. Intravital microscopy of the murine pulmonary microcirculation. J. Appl. Physiol. 104, (2), 338-3346 (2008). Sylvester, J. T., Shimoda, L. A., Aaronson, P. I., Ward, J. P. Hypoxic pulmonary vasoconstriction. Physiol. Rev. 92, (1), 367-520 (2012). Schumacker, P. T. Lung cell hypoxia: role of mitochondrial reactive oxygen species signaling in triggering responses. Proc. Am. Thorac. Soc. 8, (6), 477-4784 (2011). Paddenberg, R., König, P., Faulhammer, P., Goldenberg, A., Pfeil, U., Kummer, W. Hypoxic vasoconstriction of partial muscular intra-acinar pulmonary arteries in murine precision cut lung slices. Respir. Res. 29, (7), 93-109 (2006). Paddenberg, R., et al. Mitochondrial complex II is essential for hypoxia-induced pulmonary vasoconstriction of intra- but not of pre-acinar arteries. Cardiovasc. Res. 93, (4), 702-710 (2012). Wang, L., Yin, J., et al. Hypoxic pulmonary vasoconstriction requires connexin 40-mediated endothelial signal conduction. J. Clin. Invest. 122, (11), 4218-4230 (2012). Archer, S. L., Huang, J. M., et al. Differential distribution of electrophysiologically distinct myocytes in conduit and resistance arteries determines their response to nitric oxide and. 78, 431-442 (1996). Yamaguchi, K., Suzuki, K., et al. 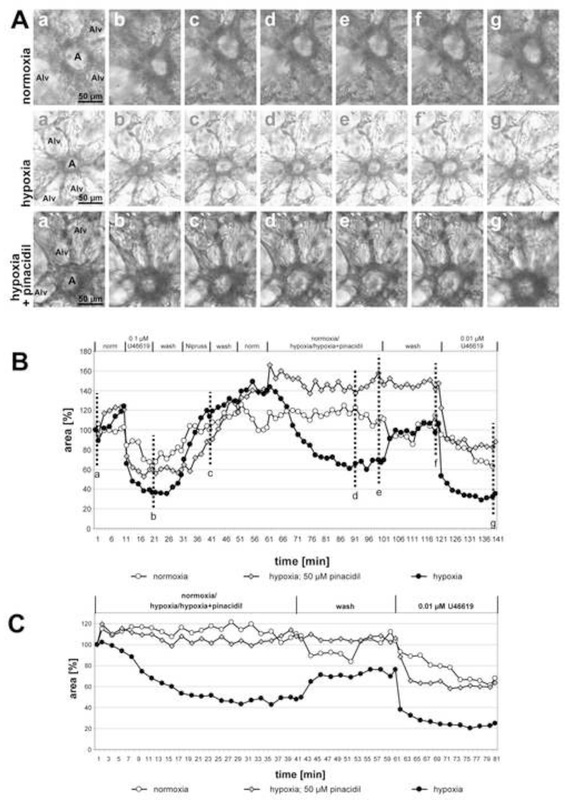 Response of intra-acinar pulmonary microvessels to hypoxia, hypercapnic acidosis, and isocapnic acidosis. Circ. Res. 82, 722-728 (1998). 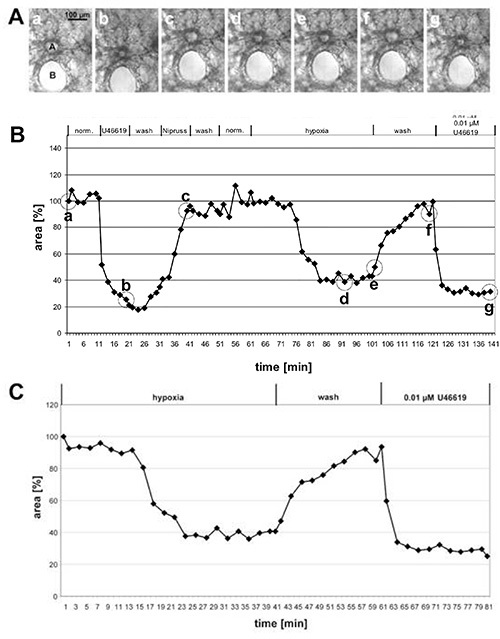 Bennie, R. E., Packer, C. S., Powell, D. R., Jin, N., Rhoades, R. A. Biphasic contractile response of pulmonary artery to hypoxia. Am. J. Physiol. 261(2 Pt. 1, 156-163 (1991). Glazier, J. 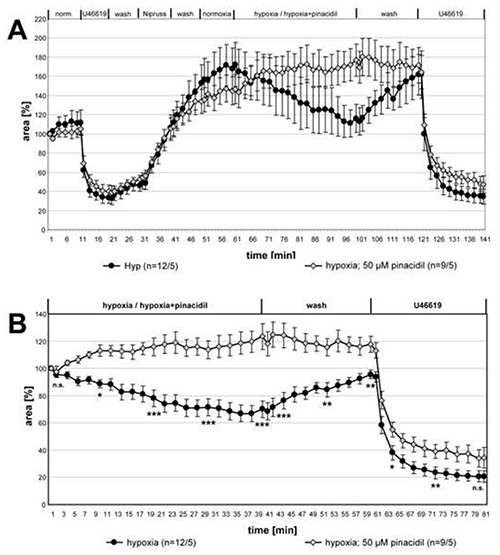 B., Murray, J. F. Sites of pulmonary vasomotor reactivity in the dog during alveolar hypoxia and serotonin and histamine infusion). J. Clin. Invest. 50, (12), 2550-2558 (1971). Bhattacharya, J., Staub, N. C. Direct measurement of microvascular pressures in the isolated perfused dog lung. Science. 210, 327-328 (1980). Kuebler, W. M. Real-time imaging assessment of pulmonary vascular responses. Proc. Am. Thorac. Soc. 8, (6), 458-4565 (2011). Martin, C., Uhlig, S., Ullrich, V. Videomicroscopy of methacholine-induced contraction of individual airways in precision-cut lung slices. Eur. Respir. J. 9, (12), 2479-2487 (1996). Grimminger, F., Spriestersbach, R., Weissmann, N., Walmrath, D., Seeger, W. Nitric oxide generation and hypoxic vasoconstriction in buffer-perfused rabbit lungs. J. Appl. Physiol. 78, 1509-1515 (1995). Ng, L. C., Kyle, B. D., Lennox, A. R., Shen, X. M., Hatton, W. J., Hume, J. R. Cell culture alters Ca2+ entry pathways activated by store-depletion or hypoxia in canine pulmonary arterial smooth muscle cells. Am. J. Physiol. Cell Physiol. 294, (1), 313-323 (2008). Fehr, D. M., Larach, D. R., Zangari, K. A., Schuler, H. G. Halothane constricts bovine pulmonary arteries by release of intracellular calcium. J. Pharmacol. Exp. Ther. 277, (2), 706-713 (1996). Oshima, Y., Ishibe, Y., Okazaki, N., Sato, T. Isoflurane inhibits endothelium-mediated nitric oxide relaxing pathways in the isolated perfused rabbit lung. Can. J. Anaesth. 44, (10), 1108-1114 (1997). Sanderson, M. J. Exploring lung physiology in health and disease with lung slices. Pulm. Pharmacol. Ther. 24, (5), 452-465 (2011). Davies, J. Replacing Animal Models: A Practical Guide to Creating and Using Culture-based Biomimetic Alternatives (Google eBook. John Wiley & Sons. 57-68 (2012). Müller-Redetzky, H. C., Kummer, W., et al. Intermedin stabilized endothelial barrier function and attenuated ventilator-induced lung injury in mice). PLoS One. 7, (5), (2012). Russell, W. M. S., Burch, R. L. The Principles of Humane Experimental Technique. Universities Federation for Animal Welfare. Wheathampstaed, UK. (1959). Held, H. D., Martin, C., Uhlig, S. Characterization of airway and vascular responses in murine lungs. Br. J. Pharmacol. 126, (5), 1191-1199 (1999). Köhler, D., Schönhofer, B., Voshaar, T. Pneumologie: Ein Leitfaden für rationales Handeln in Klinik und Praxis. Thieme Verlag. 198-19 (2009). Will, J. The Pulmonary Circulation. in Health and Disease. Elsevier Science, p49. (1987). Faro, R., Moreno, L., Hislop, A. A., Sturton, G., Mitchell, J. A. Pulmonary endothelium dependent vasodilation emerges after birth in mice. Eur. J. Pharmacol. 567, (3), 240-244 (2007). Wright, J. L., Churg, A. Short-term exposure to cigarette smoke induces endothelial dysfunction in small intrapulmonary arteries: analysis using guinea pig precision cut lung slices. J. Appl. Physiol. 104, 1462-1469 (2008).